Lawrence Allen & Associates is a firm founded on the principles of integrity and market expertise. We put our clients’ interests first in an effort to create long lasting relationships. Lawrence Allen works with Individual Owners, FDIC Banks, Portfolio Asset Managers and Trustees. We have the capabilities to manage entire portfolios or stand alone individual properties. We offer the flexibility of multi-tiered service levels ranging from reporting services to full service property management. Lawrence Allen & Associates will procure the maintenance experts. Our vendor relationships allow us to assign and manage experts for virtually all situations. Lawrence Allen & Associates regularly tours our managed properties to prevent any lingering issues from generating additional repair costs. We focus on maximizing the life and profitability of the asset. Upon initiating a project, Lawrence Allen & Associates perform a maintenance audit. With the audit report we will generate a long term maintenance schedule from which to project maintenance reserves. We audit the condition of the roofs, hvac units, paint, parking areas and general building areas. When needed, our attorney relationships ensure an expeditious eviction process giving us the quickest and easiest path to re-leasing the property and creating a renewed and profitable situation. Lawrence Allen & Associates performs lease audits to ensure that all the rental increases have been applied and that each tenant remains in compliance with the leases. Lawrence Allen & Associates helps with the lease renewal strategies. Lawrence Allen & Associates prioritizes working with existing brokerage relationships. 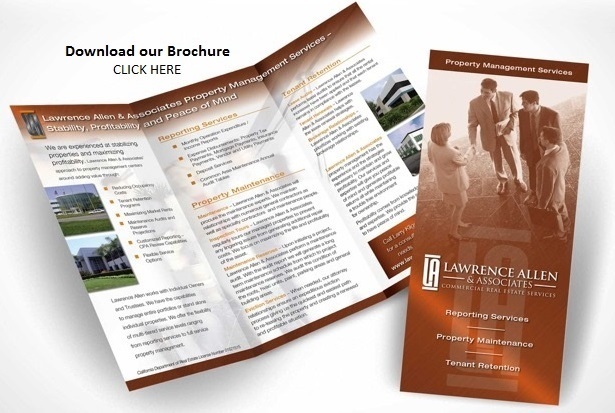 Lawrence Allen & Associates’ property management has the experience and the strategies necessary to maintain and grow profitability. Our services and expertise will give you peace of mind and generate profitable returns all while maintaining a trouble free environment for ownership. Profitability comes from knowledge, planning and expertise. We provide the services you need to have peace of mind.